At one time or another, we have all woken with a strange aching pain in our neck. It may be from the position kept while sleeping or as a result of a sudden movement. A kink in the neck is not a serious condition, but it can certainly interrupt your daily activities. Before you reach for a pain reliever in the form of a pill, discover natural ways on how to get rid of kinks in your neck with our home remedies. Kinks in neck can be described as having a stiff neck with a soreness sensation. You may have difficulty in moving the head from side to side. To be able to turn your head, the act of moving or twisting the body while keeping the neck still may be required to look sideways. 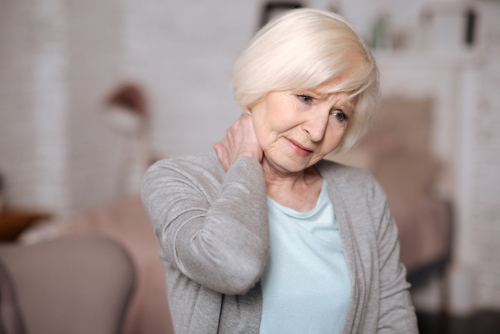 Most of the time, the sore neck and stiffness usually last a few days or one week. The severity and length of condition depend greatly on the cause, as well as any sore neck remedies used. We will first learn what causes a kink in the neck and the best stiff neck remedies. So, is there a neck kink cure? Unfortunately, there is no special pill or remedy to eliminate symptoms of a stiff neck instantly. You can try the following home remedies to alleviate the discomfort and pain. Here’s how to help a kinked neck, as well as ways on how to prevent straining the neck muscles in the first place. The use of ginger may be your best attempt for the quickest pain relief. Simply combine water with ginger pulp or dry ginger powder to create a paste. Then, apply this paste directly on the affected area of the neck, and the pain will subside within minutes. Use a hot water bottle or a heating pad on the affected region of the neck for at least 30 minutes. Repeat until the tender soreness is gone. For an overnight treatment, use the powerful oil of the clove to relax muscle spasms. Wrap cloves in a cloth, and apply it to the neck when settling in bed for the night. Gently perform neck exercises to maintain mobility. Please note that you should never push your neck beyond its limits. Turn your head to the left and then slowly to the right to loosen neck muscles. Repeat from side to side 10 times. Next, move your head up and down in slow, gentle stretching motions. Repeat 10 times. Epsom salts are another great way to get pain relief, as they stimulate circulation and regulate enzymes. The salts contain a chemical compound called magnesium sulfate, known to ease tense muscles and alleviate pain. Simply add two cups of Epsom salts to warm bath water. Use the analgesic properties of peppermint oil to combat pain while the menthol compounds relax your muscles. Add a few drops of the oil to two teaspoons of heated olive oil. Massage solution on affected area of your neck. Repeat twice each day. You can also soak a cloth in a bowl of cold water and two drops of peppermint oil for a 15-minute compress treatment. Apple cider vinegar has anti-inflammatory and antioxidant properties to combat the effects and causes of a stiff neck. Apply a cloth soaked in the vinegar on the affected region of the neck for two to three hours. Repeat twice each day. You may also want to add two cups of the vinegar to your bath water. There are precautions to take to prevent kinks in the neck. The following can be done several times throughout the day at work and home. Prevent tense muscles by managing stress through breathing techniques. Use yoga, meditation, or targeted breathing with progressive relaxation exercises. In a quiet spot, close your eyes as you tighten each muscle one by one from your head to your toes. You can also do deep abdominal breathing to fight stress. Stretch your neck and shoulder muscles when you are sitting in one position for a prolonged time, such as when you are in front of a computer screen. Do this by rolling shoulders back and down. You can also stretch the muscles by squeezing the shoulder blades as if to touch one another. Take intermittent short breaks when maintaining an abnormal position for times such as when driving or using a mobile phone. Be aware of the position when at rest or sleep. It is advisable to sleep only on your back or side. Having a kink in the neck can literally be a pain in the neck. Whether you slept in a strange position or moved your head with a sudden jerk, a stiff neck can happen quickly and easily. But thankfully, a stiff or kinked neck is not a serious condition and poses no health risk. Knowing what causes a sore neck can help you know how to prevent such an annoyance from recurring. You can treat the discomfort, pain, and lack of mobility with our easy home remedies. Staehler, R., “Stiff Neck Causes, Symptoms, and Treatment,” Spine-health, March 21, 2017; https://www.spine-health.com/conditions/neck-pain/stiff-neck-causes-symptoms-and-treatment, last accessed June 16, 2017. “Do You Have a Stiff Neck? Try These Simple Remedies,” Cleveland Clinic, May 18, 2015; https://health.clevelandclinic.org/2015/05/do-you-have-a-stiff-neck-try-these-simple-remedies/, last accessed June 16, 2017. “Kinked Neck Remedies,” Home Remedies For You, January 15, 2008; http://www.home-remedies-for-you.com/askquestion/13370/kinked-neck-remedies.html, last accessed June 16, 2017. “How to Get Rid of a Stiff Neck,” Top 10 Home Remedies; http://www.top10homeremedies.com/how-to/how-to-get-rid-of-a-stiff-neck.html, last accessed June 16, 2017. “9 Home Remedies for Stiff Neck,” Home Remedies Ffr Life, December 31, 2015; http://homeremediesforlife.com/stiff-neck/, last accessed June 16, 2017.